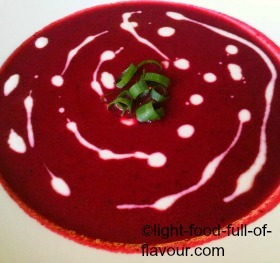 I LOVE this super-delicious Asian-style beetroot soup (beet soup). It is absolutely full on when it comes to flavour. And it is healthy and low in calories – what’s not to love! It is also quite quick to make. I use organic, cooked beetroots (beets) in natural juices - they are available in a lot of supermarkets in the UK - but you can of course use raw beetroots that you cook yourself. I cook my vegetables for this soup in coconut oil, which is the healthiest fat to use for cooking (it is sold in most health food shops). It will also give this soup an extra flavour kick and if you can’t get hold of coconut oil, I suggest you add a couple of tablespoons of creamed coconut or coconut milk to the soup. I serve my Asian-style beetroot soup with a dollop of natural yogurt and also scatter some chopped spring onions (scallions) on top. Tip: to get more juice out of a lime, press down with your hand on the the lime fruit and roll it forwards and backwards for 1 minute before cutting it in half. 1. Place the coconut oil in a large sauce pan over a low heat. Add the spring onions, ginger, garlic, chillies, lemon grass and the stalks of the coriander to the pan. Stir and cook gently for about 5-7 minutes, until softened but not browned. 2. Add the beetroots and hot stock to the sauce pan. Remove the pan from the heat. Add the coriander leaves to the pan. Either blend until smooth using a stick blender, or - after having cooled the soup - use an ordinary blender and then return the soup to the pan. 3. Add the fish sauce and lime juice to the soup, season with some black pepper and re-heat the soup. Taste and check the seasoning before serving. If you find that this Asian-style beetroot soup is too thick for your liking, simply add some water.